Over the last few weeks, the night sky has been beautiful here in Norfolk. January is a good time for star gazing, and I spent a lot of time looking up and picking out the different star constellations. Later on in the month after several days of being snowed in, I finally made it back into into the office. Late afternoon I noticed the gorgeous moon as I looked up from my top floor desk. I decided it was about time I had a go at photographing it, and willed the sky to stay clear until I made it home. 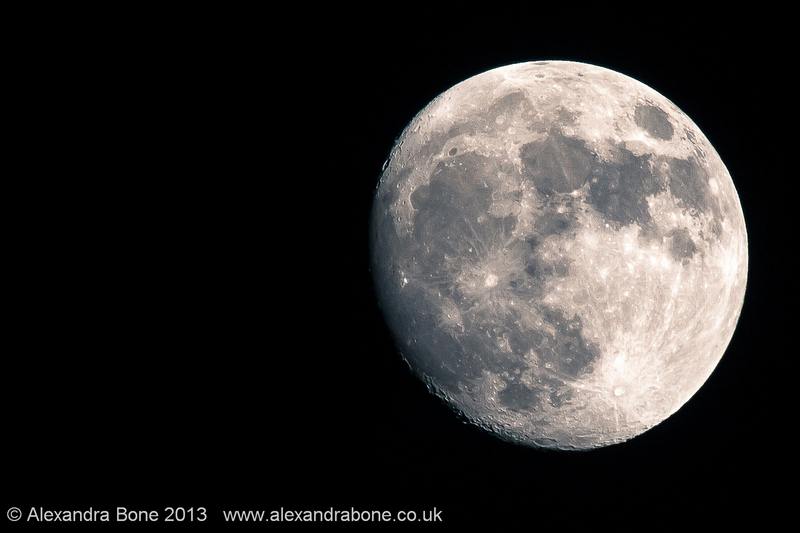 Luckily it did, and I took this shot on 24th January using a 50-500mm Sigma lens. Even with this mighty zoom, I had to crop the shot quite a bit, but I was amazed at the details that could be seen on the surface of the moon. Three nights later, and in slightly different circumstances, I found myself outside again, this time looking at the ground as the snow melt combined with a large amount of rain had caused the river running past our house to burst it's banks. During Sunday evening we were keeping half hour checks on the river levels as the water crept slowly up the garden and the front driveway. Whilst outside I noticed the reflection of the now full moon on the newly created front garden lake (formerly a pond). Looking up, it was beautiful and I trudged in over the soggy ground to get the camera again and set up my tripod. After all, I might as well do something fun to take my mind off the potential danger to life and property, right? After a few shots I experimented with the settings, with half an eye on the sky. I noticed something creeping into the right hand side of my vision and realised it was a plane about to cross right in front of the moon. I lunged for the shutter release and hoped for the best as the plane flew right across my viewfinder leaving a dark contrail behind. Such was the speed of it, I managed two frames. Cue quite a lot of excitement and also nervousness as I realised I had slowed down my shutter speed and that I was relying on the lens focusing properly and me not wobbling things about too much to capture anything. Luckily for me, I got a just about useable shot out of it. A week later and this is proving my most popular photo to date. It has had interest from national and international media and comments from around the world. I have even discovered what flight it was with the help of a friend, who established it was a Boeing 737, flight SAS7416, from Tenerife to Trondheim in Norway. 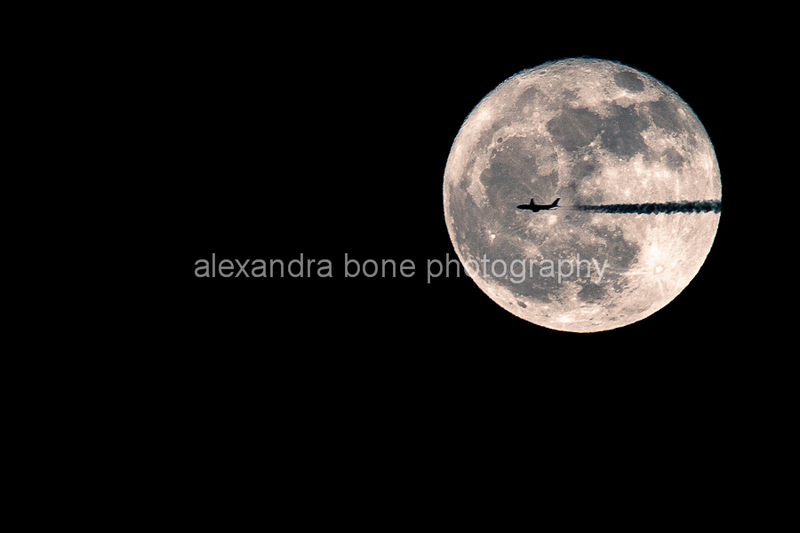 The plane was travelling at approximately 580mph when I photographed it, so I'm amazed it came out at all. For those camera minded people amongst you, this was shot at ISO500, f11 and shutter of 1/160. I wonder how much clearer it would have been at my previous setting of f9 and 1/250? I'll never know. If you are interested in using this photo, then please do get in touch. This photo appears in my Flickr "100 most interesting shots", so if you are interested in my most interesting shots according to Flickr please take a moment to view the slideshow. whoa! what fabulous photos. Those shots are just stunning.